Dassault Aviation launched the Falcon 6X business jet in February 2018. Credit: Dassault Aviation. The business jet will make its maiden flight in 2021 and will be available for delivery in 2022. Credit: Dassault Aviation. The business jet will feature a spacious cabin, which will be 12.3m-long and 2.58m-wide. Credit: Dassault Aviation. 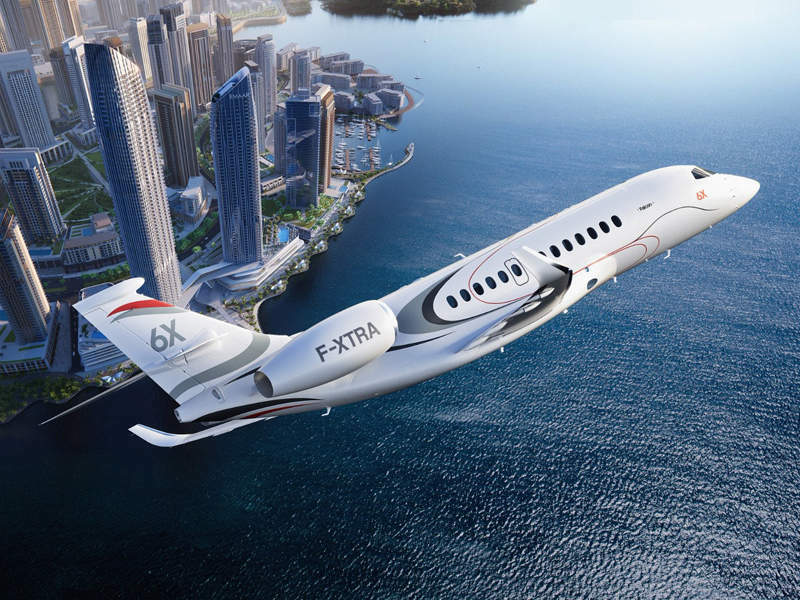 Falcon 6X, the latest aircraft in the Falcon family of business jets, is being developed by Dassault Aviation. A model of the business jet was unveiled in February 2018. The aircraft will replace the Falcon 5X aircraft programme, which was cancelled in December 2017. The first flight of Falcon 6X is expected to take place in 2021, while deliveries are scheduled to begin in 2022. Based on the Falcon 5X, the aircraft will integrate the proven aerodynamics and system features of the Falcon 5X. It will be a highly advanced, versatile and more spacious jet compared to previously launched aircraft in the Falcon series. The aircraft will feature optimised wing structures, which will offer greater lift / drag ratio, resulting in improved fuel efficiency and reduced turbulence. The leading-edge slats and the trailing edge design will enable the aircraft to take-off at lower distances and attain maximum speed within a short time. The aircraft will feature flaperon, which will be controlled by the on-board digital flight control system (DFCS). The aircraft will have a length of 25.68m (84.3ft), height of 7.47m (24.6ft), and a wingspan of 25.94m (85.1ft). The Falcon 6X aircraft will be equipped with an integrated EASy III cockpit avionics system and best-in-class fly-by-wire systems. The avionics suite will include a FalconEye combined vision system, electronic flight bag solution, and digital flight control system (DFCS). The situational awareness of the crew will be enhanced by the combined vision system, while the FalconSphere II electronic flight bag solution on-board will support the crew on the ground and during flight. Other avionics systems will include wide-screens, head-up display, and a 3D colour weather radar system. 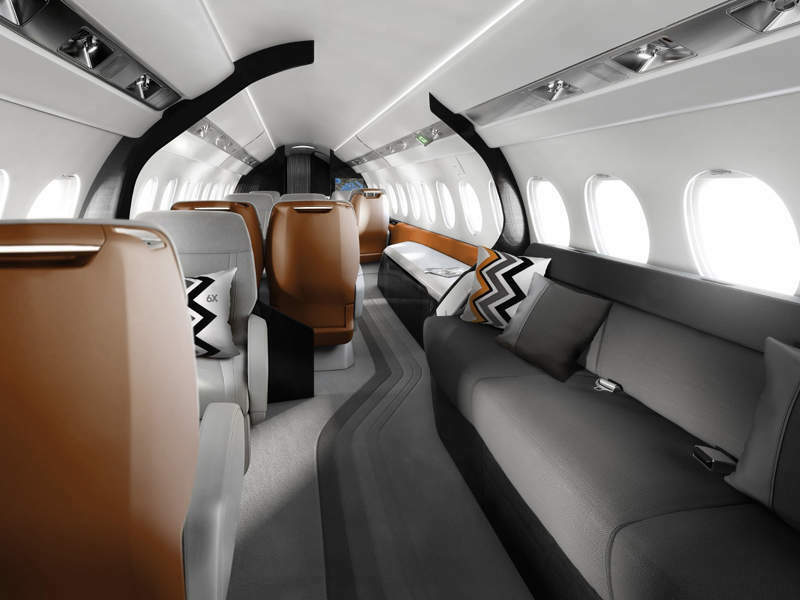 The business jet will feature the most spacious and contemporary cabin in its segment. The cabin will measure 12.3m (40.4ft) long and 2.58m (102in) wide. The total volume and maximum headroom offered by the cabin will be 4.4m³ (1,843ft³) and 1.98m (78in) respectively. The large cabin will feature three lounge areas and can accommodate 16 passengers. It will be fitted with 28 large windows and a unique galley skylight to allow maximum natural light into the aircraft. The wider aisle will allow the passengers to move across the cabin freely. The cabin will feature an advanced air filtration system, which will circulate the refreshed air every two to three minutes. The Falcon 6X business jet will also feature an integrated advanced cabin system, allowing the occupants to control the electronic devices using a mobile application. The application will be available for iPhone devices and will be used to control the lighting, sound levels and other cabin management systems. The Falcon 6X will be powered by two Pratt & Whitney Canada PurePower PW812D engines. Each engine will produce a maximum thrust of up to 14,000lb while operating at ISA+20ºC conditions. The power-plant will enhance the efficiency, operability and reliability of the aircraft multi-fold. The business jet can attain a maximum operating speed of 685km/h (370k) and can fly at a maximum altitude of 15,545m (51,000ft). The balanced field length of the aircraft will be 1,600m (5,250ft), while the maximum range will be 10,186km (5,500nmi). The maximum take-off weight and maximum landing weight of the Falcon 6X will be 35,135kg (77,460lb) and 30,025kg (66,190lb) respectively. The aircraft will have the maximum zero-fuel weight of 20,830kg (45,920lb). 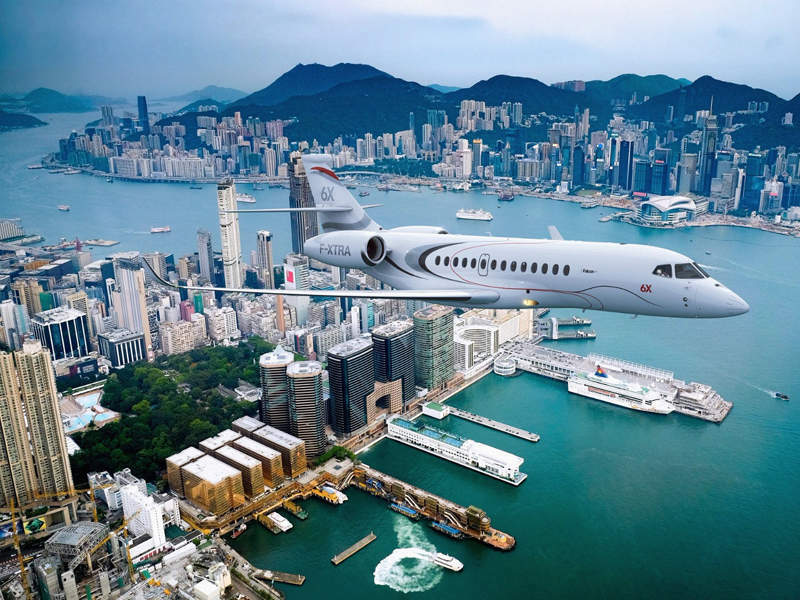 Dassault Aviation contracted UTC Aerospace Systems for the supply of advanced nacelle system for the Falcon 6X business jet in February 2018. In February 2018, Pratt & Whitney Canada was selected to provide its PW812D engine for the Falcon 6X. Biggles Labelling Limited is the industries' leading manufacturer and supplier of internal aircraft placards. We provide an unrivalled range of decals and placards for a full range of commercial, freight and executive aircraft.